We are E-Carparts Ltd Of Sandy Bedfordshire, X-Part Service Centre & MG Rover Specialist, suppliers of Original MG Rover Parts at wholesale prices delivered to your door. 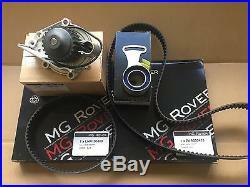 Genuine MG Rover Timing Belt Kit. Inc both belts, water pump tensioner & spring suitable For The MG & Rover Range Fitted With The 1.8 VVC Engine. Rover 200 BRM, MGF 160, MGZR 1.8vvc. 1 x ZUA000410 FRONT TIMING BELT. 1 x LHN100400 REAR CAM BELT. 1 x LHP10015 MANUAL TENSIONER. 1 x PEB102511 WATER PUMP. 1 X ZUA000420 TENSIONER SPRING. The item "GENUINE MG ROVER 200 25 MGF MGTF VVC TIMING BELT KIT + WATER PUMP 1.8 1800 MG TF" is in sale since Friday, May 5, 2017. This item is in the category "Vehicle Parts & Accessories\Car Parts\Engines & Engine Parts\Other Engines & Engine Parts". The seller is "ecp2004" and is located in SANDY BEDS.